The Lucky Dragon project at 300 W. Sahara, between the Golden Steer restaurant and Allure—a high-rise condo building—is fully funded and on track to be completed in 2016, according to a recent release by the project’s developers. “Our principals have provided the financial commitments necessary to ensure Lucky Dragon’s development remains on track for an opening later this year,” said David Jacoby, chief operating officer of Lucky Dragon..
Those principals include long-time real estate developer Andrew Fonfa, CEO of the Las Vegas Economic Impact Regional Center, which is backing the project. William Weidner, former president of Las Vegas Sands Corp.. is also a principal. The backing is said to have come from the Fonfa and Weidner families, according to a recent release about the projects timeline. This comes after years of shaky ground for the 2.5-acre site. Pre-recession, the site was pegged to house a twin of the neighboring Allure project—a 41-story, 428-unit high-rise condo building. The city’s overabundance of high-rise product and a sinking condo market kept the idea dormant. 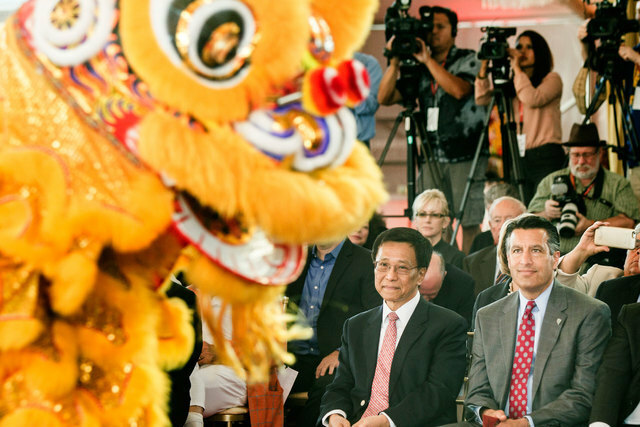 Plans for the $139 million Lucky Dragon project came to pass around 2012, when approvals to build were sought. The first signs of life came to the site about a year ago when Penta Building Group of Las Vegas poured the concrete foundation to the nine-story, 204-room project. The new casino, largely aimed at Asian visitors and locals, is also going to sport a 27,500-square-foot casino, filled with table games such as baccarat and pai gow poker. Amenities will also include a 4,500-square-foot spa, that will focus on reflexology treatments, along with other services. Along with several Pan-Asian dining options, Lucky Dragon will also have a tea garden. And a 1.25-ton glass dragon sculpture will be suspended from the ceiling. The project did run into some turmoil near the end of 2015, when the development’s financial future seemed uncertain. Lucky Dragon’s developers went to the city in hopes of gaining tax increment financing. But the city failed to approve a sum of $25 million to help project developers finish up construction. Developers blamed the slowdown in China, along with other uncertainties, for the need to be subsidized. At tht time, the project’s investor pool consisted mostly of overseas investors. But the Asian-backed hotel, which was designed around bringing an authentic Asian cultural and gaming experience, according to a release, is on its way to having its gleaming lights decorate the night sky. A neighboring Asian-themed project is also armed with a more specific completion date: Resorts World Las Vegas. The property has had a long history of ups and downs because of recession-era woes. The project site was abandoned by Boyd Gaming near the start of the downturn in August 2008, when the gaming company left behind its plans for Echelon. The land that once held the Stardust would later be sold to Malaysia-based Genting Group for $350 million in 2013. Not long after that in 2014, Genting received approvals to operate in the state. Genting’s $4 billion project broke ground in early May 2015, about a year ago. The plans at that time were to have a 2018 opening day. In a recent report from the Associated Press, the megaproject is now being pinpointed to have an opening day in early 2019. Plans for the site include 3,500 rooms and 150,000-square-foot casino, according to AP. This number is smaller than previous plans that called for 175,000-square-foot gaming area. Resorts World General Counsel Gerald Gardner told the Nevada Gaming Control Board “full-scale construction at the former site of the Stardust would begin sometime in the last three months of this year,” the AP reported in early May. Site work is expected to ramp up this summer. During Genting’s groundbreaking ceremony in 2015 on the more than 87-acre site, speakers estimated thousands of construction jobs woud be created. Genting Group has properties all over U.S. and abroad. Some of its holding include Resorts World New York in New York City and Resorts World Sentosa, which is one of only two casinos in Singapore. The company’s flagship property is in Malaysia. Globally, the company services 50 million customers annually.